A comprehensive, well laid-out mixer that feels at home in the studio or front of house. Great ergonomic, easy to use design. FireWire I/O. Ability to function in several different scenarios. No motorised faders. Not quite one knob per function. 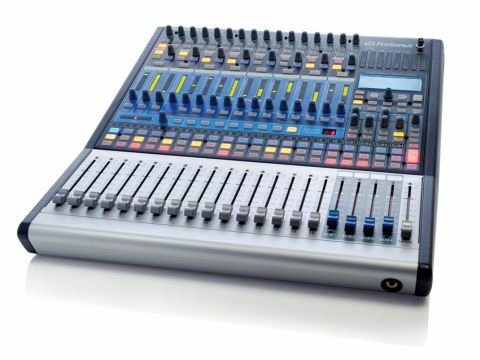 The name says it all really: the StudioLive 16.4.2 digital mixer from PreSonus is intended for use both in a studio environment and for mixing front of house (and monitors) at a live show. The company's intention was to pack this new product with a set of features that would allow it to straddle the boundaries - so does it succeed? Let's take a look. What you get is a 16:4:2 mixer - that's 16 input channels feeding four subgroups and the main stereo output. There are eight auxiliary sends - two permanently assigned to a pair of onboard stereo effects processors, the others available to access external effects or to be used for cue/foldback - plus a pair of stereo aux inputs to bring external sounds back into the mixer and a stereo two-track I/O. Besides these mixing capabilities, the StudioLive functions as a 32 x 18 FireWire audio interface. Each input channel can send audio to your computer, as can another eight stereo pairs selected from subgroups, aux sends and other mixer sources. 16 FireWire channels return single audio tracks to the input channels simply by pressing the FireWire button on each channel, while you can also route a stereo mix via FireWire to the two-track input or monitoring bus. The StudioLive is certainly a nice looking mixer -colour coordinated with a large number of illuminated rubber buttons that turn bright to show their active status. It's also very practical in its layout - all the connections, bar the necessary front-surface headphone socket, are tucked away round the back and the compact sloping front panel surface lets you see all the controls very clearly and keeps them close enough that you don't have to stretch to reach them. Most of the central part of the upper sloping surface is taken up by the Fat Channel. It is here that EQ and dynamics processing for every audio stream on the StudioLive is carried out - a Select button on each input channel, auxiliary send and subgroup plus the main output gives access to the Fat Channel's controls - a small LED window at its bottom right hand corner letting you see exactly which channel etc it is processing. The Fat channel has a bunch of clearly-labelled knobs, each coupled to a 16-ladder LED display showing its parameter value. There's a high-pass filter plus dynamic control in the form of a gate/expander with threshold and release controls, a compressor with adjustable threshold, ratio, attack, release and gain plus a basic limiter. "Most of the central part of the upper sloping surface is taken up by the Fat Channel." EQ is four-band with low, low-mid, high-mid and high bands each with frequency and gain controls. Panning plus routing to subgroups or the main output is also carried out in the Fat Channel section. Aux sends are selected one aux at a time for all channels - selecting the Control button for a particular aux assigns the 16 Fat channel knobs as the sends (one per input channel) for that aux with the consequent send levels displayed on the associated LED ladder. The two auxes that access the internal effects are known as FX A and FX B and each addresses a stereo DSP effects engine with 50 factory reverb or delay effects presets and 50 user memory slots. All the effects have several adjustable parameters with a dedicated display window for editing as well as tap tempo where appropriate. The desk's compact master section has the necessary controls for the monitoring options plus a handy talkback button, although there's no built-in mic so you'll have to plug one into the rear panel for that. One big advantage that digital mixers can have over analogue is the total recall of parameters - something that should happen at a flick of a switch if you want to go back to a mix that you were working on previously or null the controls for a fresh session. With the StudioLive you can create and store a library of scenes that include six different categories of parameters - assignments and routing, EQ and dynamics settings, aux mixes, fader, knob positions, mutes and internal effects parameters. Some of these categories can be disabled if you do not wish to recall them. Created exclusively for use with the StudioLive and bundled with it, Capture is a basic audio recording application that is set up to record 16 channels of audio directly from the mixer's input channels and/or a single stereo track from the StudioLive's main output, one pair of subgroup outputs or a pair of aux sends. 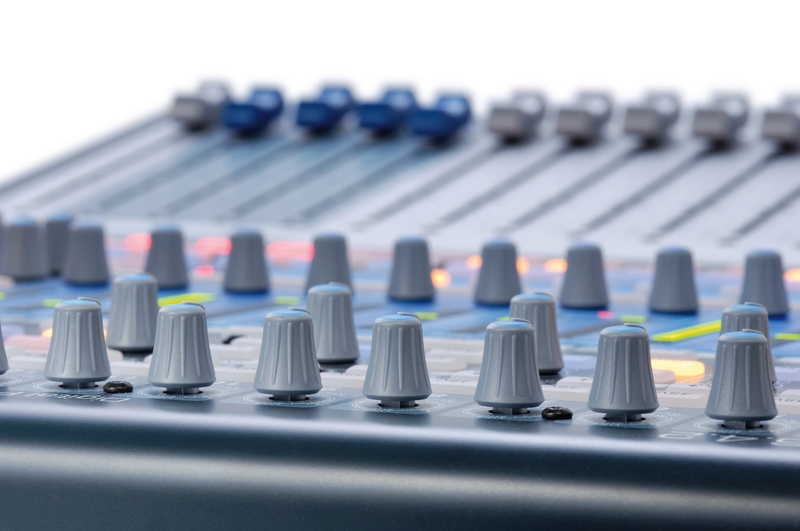 This gives you the option, if the mixer is being used for a live show, of recording a different stereo mix than that being heard through the PA.
PreSonus has made simplicity the key to Capture's operation - 16 tracks can be armed ready to record with the click of a single button and recording starts with another single click. Basic editing facilities (copy, cut, paste, splice, resize) are available should you need them, but file export is available in WAV and Open TL formats so that any captured audio can be easily transferred to all of the major mainstream DAWs for further editing. Recorded tracks can also be sent back through the StudioLive's FireWire playback inputs, taking advantage of the dynamics, EQ and onboard effects to create a full mix that can be printed back into Capture. There really is nothing difficult about operating the StudioLive, PreSonus seems to have gone out of its way to keep things simple with dedicated knobs for just about everything and very little dipping into menus - the whole experience is tactile and hands-on. Recording an ensemble or band with up to 16 input channels is very straightforward - you can choose to send a pristine signal from directly after the mic preamp without any Fat Channel processing, in which case you only have to set the mic gain and, if you are using a condenser, select phantom power for the individual channel. If you want to adjust dynamics and EQ on the way to your computer it's a simple process to select the Fat Channel for your input, engage the Digital Output Post button and dial in your processing. The StudioLive uses the PreSonus XMAX class A preamplifiers which provide a nice transparent quality sound that, coupled with pretty decent A/D conversion, will give you quality recordings. The dynamics control is pretty comprehensive with the compressor having enough adjustment for gently keeping things in check. Likewise, the EQ is fine for both gentle boosts and a bit of sculpting. Fully variable Q rather than two switchable options would have been nice on the two mid bands - something that PreSonus has implemented in the new 24-channel version. StudioLive is pretty much designed for multitasking so there are several scenarios in which it could be used. As a pure studio desk, there are enough options for recording the sound that you want - if you want to use dynamics and EQ other than the Fat Channel, each of the input channels is equipped with an insert point. The auxiliaries are all switchable between post and pre, and with six available there's plenty of scope for setting up several different cue mixes and bringing outboard effects units into the picture. Similarly this would work for live sound too - with the option for several different foldback sends. "PreSonus seems to have gone out of its way to keep things simple with dedicated knobs for just about everything and very little dipping into menu." With that in mind, StudioLive may be ideal for a small venue or a gigging band where recording the show is important - the front of house sound and monitors being taken care of while 16 channels of audio (and a stereo mix) are simultaneously painlessly recorded onto a laptop. The various combinations of reverb and delay solely provided by the onboard effects ought to be adequate for most live sound mixing scenarios and their sound is not too shabby for use if you are mixing down a recorded track on the StudioLive. Although most live engineers, given the option, would prefer an analogue-style scenario of a dedicated knob for each and every function, the StudioLive offers a hands-on interface that is easy to get around and that would be practical enough to use at a gig. Other useful functions for live use are an onboard stereo 31-band graphic equaliser on the main outputs so you can compensate for room acoustics and a socket for adding a gooseneck lamp. For overdubbing in the studio, you get the option of routing individual recorded tracks or a stereo mix back into the StudioLive via FireWire for monitoring purposes, and the mixer can also be used either to take care of the whole mixdown or as extra processing power with certain tracks sent to the StudioLive for processing and effects before returning to the computer. PreSonus wasn't the first to combine a mixer and audio interface in a single unit but it has certainly done it in a seamless and stylish way to create an extremely versatile feature-packed piece of gear that can slot into a host of situations - both in the studio and live.